Braintree and West Roxbury, MA (August 7, 2018) – Peabody Properties recently announced the pre-leasing phase of Oak Row Apartments, located at 1235 VFW Parkway in West Roxbury. First residents are expected to be welcomed in September. 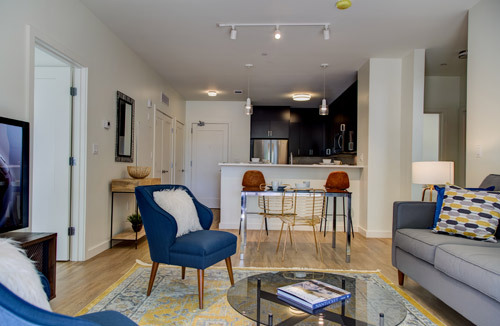 Oak Row has transformed the long-time vacant, former International House of Pancake’s Property into 80 luxury apartment homes consisting of a mix of one-, two- and three-bedroom units. This four-story luxury community was designed by award-winning architects Khalsa Design Inc. of Somerville and constructed by Dellbrook | JKS of Quincy; the interiors were created by the award-winning interiors group at The Architectural Team of Chelsea. EA Fish Development, LLC of Wellesley, along with its investment partner Luzern Associates of Greenwich, worked jointly with Sovad LLC of West Roxbury to complete this transformative community. Oak Row is professionally managed and marketed by Peabody Properties, Inc. The design intent of Oak Row was to embody the spirit of the beautiful tree-lined West Roxbury neighborhood, blending in with its natural, timbered surroundings. Oak Row is a community on the edge of the city, close to many conveniences: super markets, shopping, restaurants, cafes, coffee houses and entertainment destinations. Nearby Millennium Park offers walking and jogging trails, playground, canoe launch, ballfields and picnic areas. Residents can enjoy the convenience of going “car-free” with the MBTA commuter rail and bus service just minutes away. Complimentary transportation is provided to the West Roxbury rail station on Lagrange Street during peak AM/PM travel times and, for those who love to bike to work, there is indoor bike storage and a repair station. The community is expected to attract a wide-range of residents, from empty nesters to on-the-go professionals to young families. “This picturesque, tree-lined neighborhood is a superb amenity in its own right, combining urban edge with suburban charm,” observed EA Fish Development Executive Dana Angelo. Leasing agents will be showing the model apartments and pre-leasing at 1235 VFW Parkway Mondays through Fridays, from 10 a.m. to 5 p.m., Saturdays from 10 a.m. to 1 p.m., and evenings and Sundays by appointment.